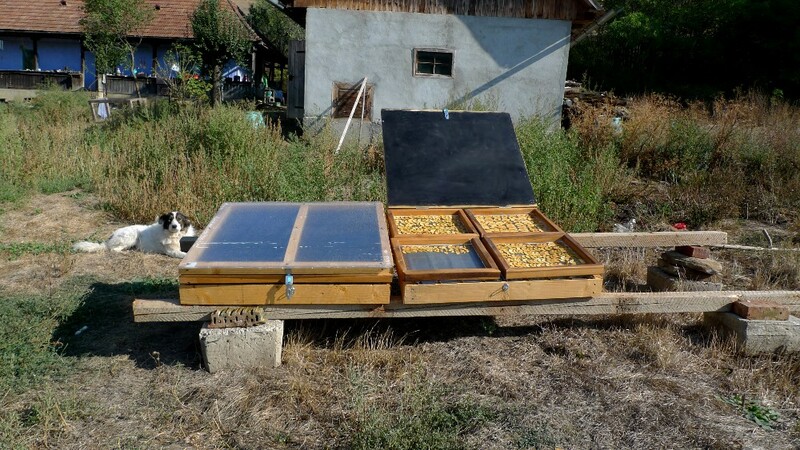 At the end of last summer I built our first two solar food dehydrators and our first experiments with them were really great. I have been asked a few times about our choices so I finally got around to writing this. First things first. Why dehydrated food? It is an additional option for preserving and storing food. Dried foods are potentially more nutritious then pickled or cooked (tomato sauce, zakuska) preservation since they don’t go through any cooking … just drying … removal of water. Dried foods require no energy to prepare (just the sun) or to store (such as freezing) … just a sealed jar. Dried foods can generally last much longer. Dried foods are easier to process. It is much easier to cut up tomatoes and put them in a solar drier then it is to process them into tomato sauce. A LOT Of my research starts (and often concludes) at BuildItSolar.com. Since this was my first solar project I invested quite a bit of effort in developing a basic understanding of thermal dynamics. It wasn’t easy at first but it was well worth the investment. If you plan to collaborate much with the sun (as I do) I suggest you do the same. Make an effort to understand how the designs work. All passive – no electric ventilation – solar heating creates air flow, air flow dries food. 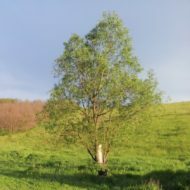 Simple to build – I have woodworking tools and basic skills, I use mostly roughly sawn pine and I am unable (for now) to produce high precision, constant sized wood. Simple to use – a system with no “options” – no thermostat and no adjustments possible – fresh food goes in and dried food comes out. No backup heat – no option to hook it up to another heat source (such as a stove) for complementary heat on when the sun isn’t sufficient. The solar collector heats air and since warm air rises, in this case it rises into the cabinet (which is placed above the solar dehydrator). This flow of warm air passes across the trays of food, absorbs moisture and escapes out the top. What is the improvement in the downdraft design? In the first (popular) design as the air rises it collects moisture and cools … and cool air tends to sink … which means that two opposing forces are now at work. Warm air is trying to rise from the collector and cool air is trying to drop down inside the cabinet. From what I’ve read this conflict can result in diminished air flow, which means that food may not dry well or fast enough, which may lead to mold … a conflicted design. The downdraft design works with the natural tendency of cool air to drop (which can be further improved by re-heating the air in the evacuation chimney so that air is both pushed in and sucked out) so it should result in better, more consistent airflow … and better drying. Both designs rely on one core feature – air flow. For efficient air-flow the entire system needs to be built as air-tight as possible … so that air cannot get sucked in or escape anywhere but where you want it. That small, often understated requirement can prove to be either difficult and/or expensive to achieve (and maintain … remember, this thing is exposed to the elements). I was about to embark on constructing a downdraft cabinet dryer when I realized that I achieving air-tightness was not going to be trivial (within the constraints of tools and resources I have available to me). I do not believe these designs to meet the 2nd criteria – simple to build (even though they are presented as such). Both designs are excellent space savers (many trays in a small space). Yet even when such designs do work well there is a functional inconsistency built into them. In both designs the top and bottom trays will never experience the same temperature, humidity and air-flow. In both designs humidity and odors build up as air passes through the shelves. Though this may work it does require more planning and thinking during usage (what goes on top, what goes on the bottom, what things do not go together, etc.). This does not meet the 3rd criteria – simple to use. So I changed my mind and went looking for something else. Eventually I arrived at Bob & Larisa at Geopathfinder. They have a lot to offer on sustainable living, drawing from 30 years of experience – including solar food drying. Their design is simple to build (with a very high tolerance for error), simple to use and, from our limited experience so far, provides reliable results. One drawback is that their design takes up more space. This is not an issue for us (living in the countryside) though I am not sure it is an issue for anyone if you take into consideration ease-of-use and reliability. I see no need to repeat information that is presented simply and clearly on their website HERE. They offer a free PDF with images from a construction workshop showing in detail how they are built. There is a lot to learn about food dehydration. Different foods require different times. There are varieties (such as with tomatoes) that are more suitable for drying than others. Some things dry really fast (herbs), other take longer and need to be timed properly especially for food (again such as tomatoes) with a high water content – in which case you need to start on a sunny day to get through the initial drying (to prevent molding over night). Most things are dried without direct exposure to sunlight, others benefit from sun exposure (mushrooms are supposed to become saturated with vitamin D). The Solar Dryers, though a do it yourself project, were not inexpensive. The most expensive material (for us) was the mesh upon which the food was placed – this need to be something that comes in contact with food that you will east (so no rusting, off-gassing, etc.). Following Bob & Larisa’s advice we searched (and just barely found in Romania) stainless steel mesh upon which the food is placed. I estimate the total cost of materials to be ~250 lei per square meter (every dryer is one square meter divided into 4 trays).